Dr. med. 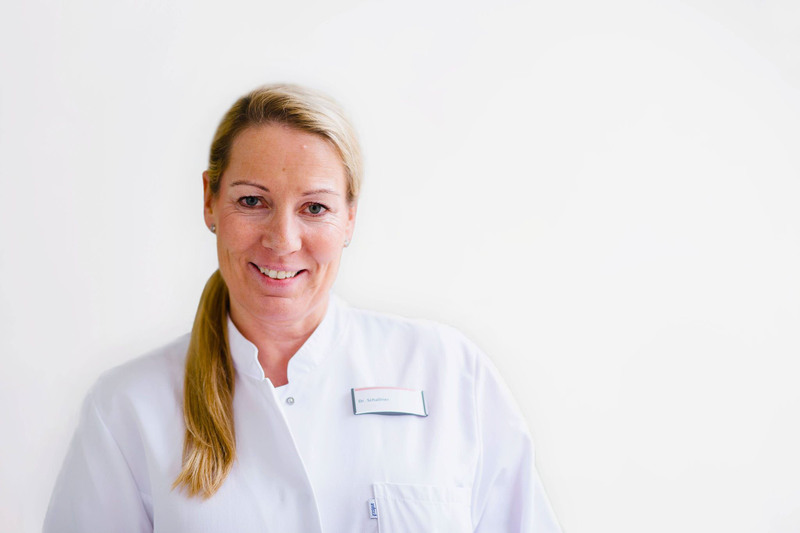 Frauke Schallner is a specialist in orthopaedics and orthopaedic rheumatology. In addition, she holds the additional title of sports medicine, the D. A. F. certificate for foot surgery and is a trained physiotherapist. After completing her training as a physiotherapist, Dr. Schallner studied medicine in Münster at the Westphalian Wilhelms University and in Frankfurt am Main at the Johann Wolfgang Goethe University. As part of her specialist training at the University of Münster, she was trained by Prof. Dr. Winkelmann in general and tumour orthopaedics as well as in endoprosthetics. After moving to Munich, she continued her training in all orthopaedic fields in the Orthopaedic Surgery Munich (OCM) in Sendling. Here she specialized in hand and foot surgery and rheumatology at Dr. Bracker. After receiving further training in orthopaedic rheumatology, she moved to Augsburg in 2012 to join Chief Physician Dr. Rozee at the Hessing Clinic, where she established a hand surgery department as senior physician. As a sports physician and trained physiotherapist, she has a broad knowledge in conservative therapy and rehabilitative medicine as well as in the treatment of sports injuries. Since December 2017, the specialist for hand surgery, foot surgery and rheumatology has been strengthening the ECOM team. Her focus is accordingly on the treatment of hand and foot diseases, orthopaedic rheumatology and conservative therapy of musculoskeletal disorders. As a former competitive athlete in athletics, Dr. Schallner continues to be active in running, skiing and yoga.